Today is the 47th anniversary of the assassination of President John F. Kennedy. On that day in 1963, five Secret Service agents were assigned to protect the president and his motorcade. And for nearly a half-century, those men have remained silent about the horror they experienced that afternoon. But now they’ve broken their silence. Gerald Blaine was a member of the so-called Kennedy detail, and he has written a new book about what he and his colleagues went through that day — and in the decades following the president’s death. Blaine’s book, The Kennedy Detail, is based on interviews with numerous Secret Service agents who had been charged with guarding the president, including Clint Hill. On November 22, 1963, Hill was traveling in the car behind the president’s in Dallas, and the day is still clear in his memory. Kennedy’s assassination has spawned many conspiracy theories. But in his book, Blaine says, he hopes to tell the full story as viewed by the people who were closest to the action. Hill says that he puts no stock in conspiracy theories, and that he and the other nearby agents did their best to protect Kennedy. 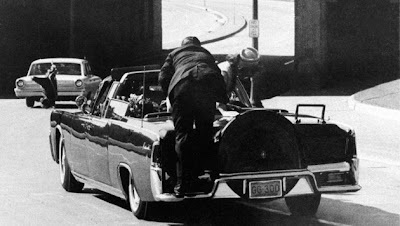 After the first shot, Hill said, he ran from the trailing car and jumped on top of Kennedy’s vehicle to protect the president and his wife. It all happened so fast, Hill said, that he didn’t think much.